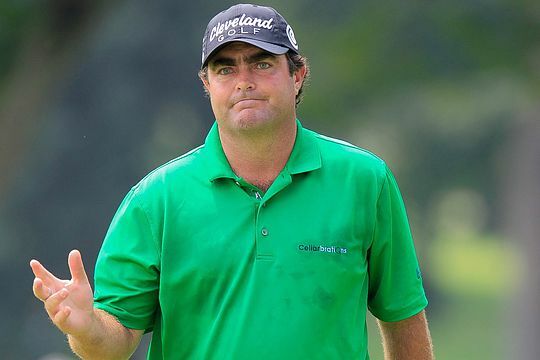 All credit to Steven Bowditch for his demeanour despite posting the highest-ever four round score in the history of the World Golf Championships – a 325 tally. There were just four people clapping when Bowditch tapped in for par to end his week at the Cadillac Championship, then walked off the 18th green with a smile as those in the grandstand applauded his effort. “Hey, it’s just golf,” said the Texas-based Australian with a smile. The 32-year old Newcastle-born, who now resides in suburban Dallas, posted rounds of 81, 80, 80 and 84 for a 37-over par total on the Blue Monster course at Trump Doral. His score was so bad that a young volunteer who was tasked with following Bowditch around with a portable scoreboard was told not to post any numbers, and no one questioned that logic. The double PGA Tour winner posted eight birdies, including three in succession mid-round on day two, but then he also recorded 14 bogeys, 3 double bogeys, 5 triple bogeys, 1 quadruple bogey and a ’10’ at his fifth hole on day two. Of Bowditch’s 325 shots, 124 were in putting to average 31 putts per round. However it was the Blue Monster that did the most damage for the player who won the 2014 Valero Texas Open and last year’s Byron Nelson Classic, and also collected more than $US6.6m in prize money. In fact, on the final day Bowditch found the water just twice at the third and 14th holes. Indeed in this week’s no-cut event Bowditch should still pocket $US48,000, despite being the first player to shoot four rounds of 80 or more in a PGA Tour event, officials said, since Mike Dunaway posted four consecutive 81s in the 1983 Panasonic Las Vegas Pro-Celebrity Classic – a five-round event. The previous high score in a WGC stroke-play event was 323, by Huang Ming-jie at Shanghai in 2013. Painful as it was for Bowditch, at least Sunday’s round went quickly. Playing alone for the second straight day, Bowditch finished his round in 2 hours, 12 minutes. He signed his card, opened a Diet Coke and was thinking about teeing it up in a couple days in Tampa by the time most of the leaders were even warming up for their final rounds at Doral.